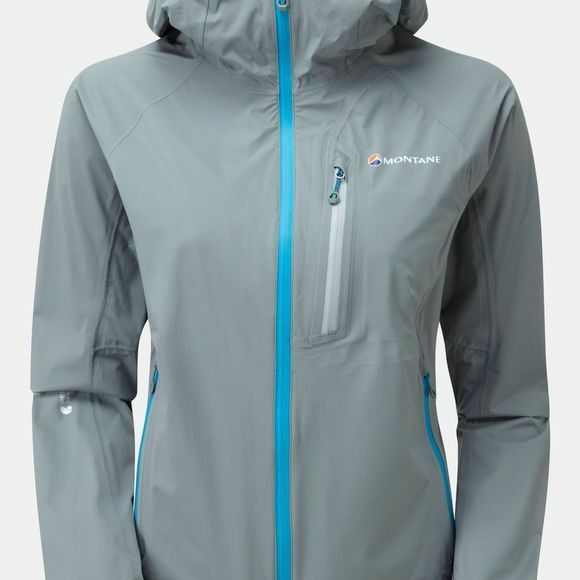 Using a super breathable Pertex Shield+ 2.5-layer fabric, the Montane Women's Minimus Stretch Jacket is lightweight and packable waterproof jacket with added stretch to allow for dynamic body movement and enhanced comfort when moving fast in the mountains. Constructed from lightweight, waterproof fabric with stretch for added comfort and ease of movement during fast mountain activities, with a durable water repellency for effective water shedding. Technical tailoring around the arms prevents arm-lift raising the lower hem while reaching high. Articulated elbows which move ergonomically with your arms. The fully adjustable hood is designed to fit comfortably with headwear. Adjustable face aperture with internal cord exits. Side hood volume compression for a close fit around head. Stiffened hood peak gives stability and wired edge allows adjustability. Mid height collar offers increased weather protection when required. Internal elastic loop and hook on rear hood compression drawcord allows the hood to be rolled down and stowed away while not in use in windy conditions. Two map-sized mesh lined A-line hand pockets with YKK matte AquaGuard zips which can also be used for venting. YKK matte AquaGuard zipped chest pocket, designed to fit GPS or mobile phone without bounce during movement. Ergonomic lightweight zip pullers make use easier when wearing gloves.